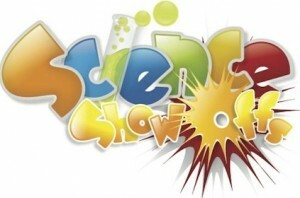 Fun activities to try at home, especially for early learners and family. Use your fingers to partially flatten about 2cm of the straw at one end. Cut the end of the straw into a point, about 1cm long. It is important the straw has a sharp cleanly cut point. Place the pointed end of the straw between your lips so the point is just past your lips. It helps to curl your lips back slightly. Blow the straw – if you don’t hear a buzzing sound try changing the position of your lips, or the amount of pressure, or how far inside your mouth the straw is. Keep trying – soon you will master it! 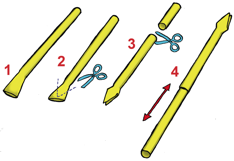 While playing the straw, try cutting about 2cm off the end (see 3). What happens? Cut small holes in your straw like it was a flute. By covering and uncovering the holes, you can change the pitch. Try sliding one straw into the other as you play, or making a longer straw (see 4). Blowing through the straw makes the pointy end vibrate (wobble really fast), which makes a sound. A short straw wobbles faster, so it makes a higher note. Sound is a form of vibration, which just means sound is created by things wobbling back and forth. When you blow through the straw, you make the tips of the point vibrate – you may feel this as you play. The sound waves travel through the air in the straw, then out through the end. The vibration travels through the air until it reaches your ears where you hear it as a sound. By changing the straw’s length, you change the speed of the vibration (the frequency of the sound). This changes the pitch or note of the sound. Most wind instruments including many traditional African instruments work on this same principle.